An NBCUniversal exec has suggested that a Downton Abbey movie is still in the cards and they’ll hopefully have things rolling along by next year. This seems to be news to the cast, though, so don’t clear your calendar just yet. 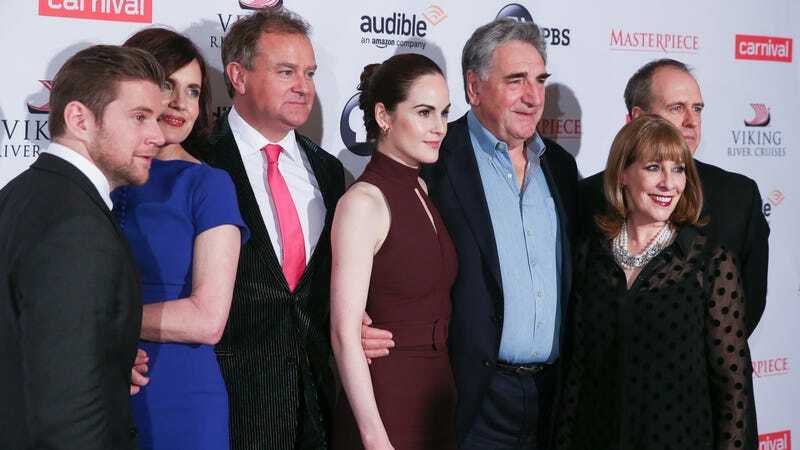 The Associated Press reports they spoke to Michael Edelstein, president at NBCUniversal International Studios, at a red-carpet event in Singapore for the traveling “Downton Abbey: The Exhibition.” “There’s a movie in the works. It’s been in the works for some time,” he told the outlet. “We are working on getting the script right and then we’ve got to figure out how to get the (cast) together. Because as you know, people go on and do other things. But we’re hopeful to make a movie sometime next year,” he added. How can they not do a movie when the TV show is apparently still generating enough interest for a traveling exhibition dedicated to its props? “I think we’ve got a film in us. I hope it happens,” said Julian Fellowes, who did say in a chat at the Guardian last month that he’s been working on a script and “it’s pretty likely the Downton movie will happen,” but there’s no green light from the studio yet. So, TBD. If it ever happens, I hope it’s in the form of a sequel set decades later which follows the process of selling the whole thing, lock stock and barrel, to a thinly veiled Madonna. Which is the only truthful conclusion to a saga about an English manor home in the twentieth century.